40 years on, the utopic vision of the student leaders of 1976 who became the politicians of 2016 simply has not been realised. 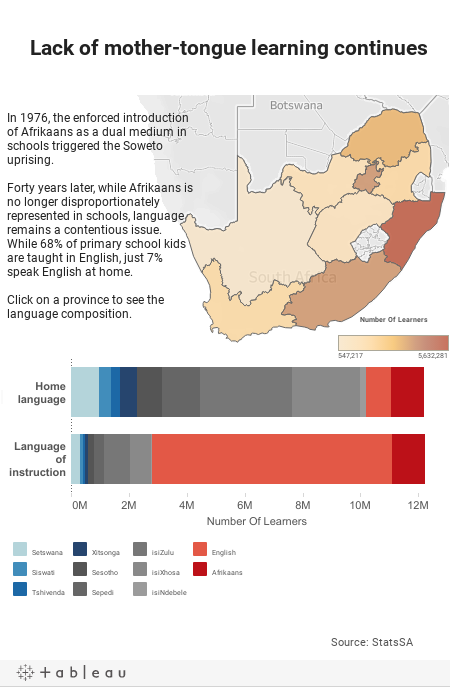 By DIANA NEILLE & SUMEYA GASA for CHRONICLE, in collaboration with the Code for South Africa Data Journalism Academy. Weaving his way confidently through the rooms of the Kilombo Way of Life Community Centre in Khayelitsha, Masixole Mlandu calls out with a jovial familiarity, greeting members giving music lessons to a group of earnest primary schoolers. Kilombo is derived from the Brazilian Portuguese word, Quilombo, the name given to runaway slave communities. It’s in this former church, reimagined as a space for black people to share art, music and knowledge, that he appears to have found a home. 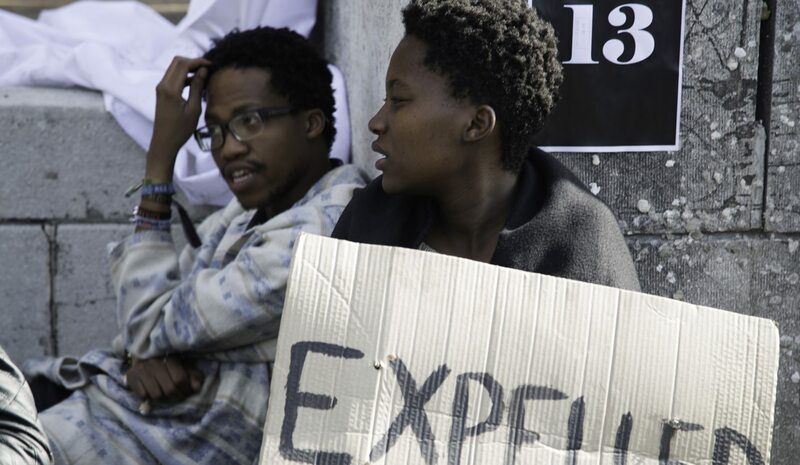 After being suspended from the University of Cape Town in May for protest-related activity, Mlandu was evicted from his room at Forest Hill Residence and instructed to pay the University’s legal fees of R250,000, along with four other prominent #RhodesMustFall members. Their movement had been victorious in the removal of Rhodes’ reviled likeness from a plinth on the Jammie steps in 2015. But the university’s administration drew the line at Shackville. He’d spent four years studying Political Science and Sociology at the University of Cape Town. Delving into academia with the like-minded peers he’d wanted since his schooldays, Mlandu’s future was beginning to resemble the makings of a dream. Within those contested halls he found what his mind and youthful energy had spent a year yearning for, as he straddled the time between matric and university. Kilombo was a space that supplemented his formal education and fuelled his ideologies. “We’ve got so much to gain – and that is our freedom. Our right to self-determine ourselves and our direction and our path in the world, and contribute to the greater good of humanity,” said Mlandu. “Our own self-independence, you know, the ability to control our environment and dictate our own destiny and where it’s supposed to be going. “It’s not only the youth who’ve got nothing to lose. Black people in general, they’ve got nothing to lose besides their chains,” Mlandu said. Forty years on, the language of Bantu Stephen Biko rolls so naturally off the tongue of a young philosopher from a different time, “the epoch of 2015”, as he describes it. One whose mother, like so many other mothers, moved to Khayelitsha for domestic work from the hills of the Eastern Cape, but who wanted to talk about Shakespeare’s inherent racism while his adolescent classmates copied couplets of iambic pentameter. Science and maths in high school he found confusing, unnecessary. They did nothing for his politics, so he switched to history and performing arts to make up the points he needed to get into university. It was uncertain, unfathomable even, that he would represent his family at an institution of higher learning, and yet, it was expected nonetheless. “Where we grow up education is very routine. So much so that people actually believe that education holds the gateway to actually getting away from poverty into a richer life,” Mlandu said. Mlandu’s activism is nostalgic. It rejects partisan politics, subscribing instead to the ideological framework of Black Consciousness. And in March last year, reinvigorated after a dormancy of four decades, it propelled the youth of South Africa into the throws of a political movement that, once again, went beyond the cry for academic inclusion for all. It sent a ripple of awakening across the world, and revisited the promises made by the African National Congress in 1994. “We were promised in 1994 that education will be free,” said Mlandu. “So if we are going to commemorate 40 years (after) 1976, surely the question of free decolonial education should be there. Surely, the question of decolonising these universities and our education system should be there?” he said. Time and again, universities have affirmed themselves as microcosms of the country at large. So to Mlandu – and his peers – it is only logical that the changes he wishes to see in higher learning institutions seep into the social fibre of South Africa. A blanket emancipation for all, with education playing a pivotal role, threaded through the fabric of time. Forty years on, the utopic vision of the student leaders of 1976 who became the politicians of 2016 simply has not been realised. For Ryland Fisher, the beginning of the end of apartheid began at the same time as his own political awakening: unexpectedly; in a classroom; during a protest, being beaten by a policeman. Now one of South Africa’s most seasoned media practitioners, back in 1976 a studious, 16-year-old Fisher decided not to take part in the protests organised at Crystal Senior Secondary School in Hanover Park, in solidarity with the 20,000 high schoolers who had staged an uprising in Soweto the week before and been met with bullets. He wanted to focus on getting good marks to achieve his goal of becoming a writer. Studying in a quiet classroom in late June, he and a few fellow pacifists listened to the singing of struggle songs in the schoolyard outside devolve into screams and chaos, as police drove an armoured vehicle through the closed gates. It was a turning point for the entire country – a moment in history that spurred on an almost unimaginable regime change in South Africa less than 20 years later, driven by the zeal of disgruntled students tired of learning in the language of their oppressors; empowered by the Black Consciousness Movement; galvanised by the energy and irreverence of youth that shook up torpid African National Congress and Pan Africanist Congress structures in exile and in prison. The students’ struggle was the people’s. The fight for fair education was the battle for lived equality. It was also the beginning of the end of black consciousness as a formal movement. A year later, more than 100 of its main drivers had been banned and 17 affiliate organisations declared illegal, its supporters beaten into submission and its leader, Steve Biko, murdered in police custody in September 1977. “(1976) forced the ANC to think a lot about what it was doing,” said Ryland. “At that point, I won’t say it was dormant because they were active but the ’76 recruits really kind of boosted the organisation and forced it to become even more active. Almost like breathing life into the organisation,” he said. In the void left by a beaten Black Consciousness movement, it was the tenets of the Freedom Charter that shaped a new ideological way forward. “Particularly in the 1980s… we started realising that we need to move beyond black consciousness and we need to embrace nonracialism,” said Fisher. Four decades later, students are still looking at what that means. They are disillusioned at best, angered at worst by the nostalgic rhetoric of Rainbowism still flogged by Fisher’s generation of stalwarts, now well into their retirement from a struggle they thought had ended in 1994. Though not yet dispensed with entirely, the ideals of nonracialism and nonsexism have taken on a bitterness among the youth that tastes like lies; that rankles the throat like the smoke from burning paintings in gilded frames, pulled from the walls of the university built on Rhodes’ land. None of their number has been killed in the furthering of Fallism. There, comparisons dare not be made to the Ryland Fishers of this country. But while their ideology is familiar to those who still believe in Biko and Black Consciousness, it sounds different. It is wise to the times, it’s woke, updated with neologisms; new -isms and -nesses. It rejects the dichotomy of pronouns that forces people to pick a place to pee based on their gender. It’s also troubling in its hotheadedness, naive in its newness, idealistic in its leaderlessness and its blanket inclusion, given the lived realities – the humanness – of those who penned it: the UCT Rhodes Must Fall Mission Statement. Before they were politicised, exposed to the bigger, bolder world of higher learning and words like “intersectionality” and “cis-gendered” and “decolonisation” to define their struggle; meeting stun grenades with crossed arms and profanities for Blade outside Parliament, they were schoolchildren. Their focus was passing matric. Siphokazi Mtiya wrings her hands as she stands in the tiny kitchen of her family shack in Khayelitsha, holding back tears. She is writing her mid-year exams – the final practice before the test round for her Grade 12 finals which, if she passes, will release her into the next phase of her life. It’s uncertain. Right now, intersectionality belongs in a parallel universe to hers. She can’t cope, she says. Matric is too difficult, and there’s no one to help. To quell her anxiety she presses her fingers together, palms apart. A battered white dining table fills the kitchen she shares with her mother, cousin and little brother, with no chairs in sight. Behind her, a tiny room concealed by a thin curtain that stands at attention in the airless enclosure. Outside in the dusty front yard, Mtiya’s cousin Onako Makhanda chats to passersby as little Qiniso loses a furious street battle between toddlers and runs for home, howling. It is late Sunday afternoon and Mtiya’s mother is at church. After five years at Esangweni Senior Secondary School, 18-year-old Mtiya finds herself at the end of the road of institutional certainty, with limited choices and a currently unobtainable dream of becoming a lawyer. Despite having fulfilled her end of the deal – working hard in school, applying to university, applying for funding – it’s not been enough. Mtiya, like many of her peers nationwide, sees a university education as the only feasible way to change her station in life; but, with six months to go to orientation week, she is faced with the disquieting, humiliating and very real possibility of academic exclusion. “If you know Mandela’s speech in 1994, he said that we would have free education. But now education is not free, it’s expensive,” Mtiya said. English is a struggle, evident in her pressed fingers and tensed palms. Like most of her Xhosa peers living in Khayelitsha and around the country, she only hears it at school. Infographic by Daniela Lépiz and Andrea Teagle for Daily Maverick, in collaboration with Codebridge. On most days her unemployed mother can’t give her and her cousin transport money to get to school. So they walk the 40-minute stretch at dawn, hoping to get there before the gates close at 8am. Often, the gates are shut before they’ve covered the distance. But that’s not all they contend with. “At our school we have gangsterism, so it’s not easy,” says Onako Makhanda, also a pupil at Esangweni. While admitting to feeling overwhelmed by the pressures of matric, their greater anxiety is their prospects for a better future – a future they’ve been promised every five years since their birth as ‘Born Frees’, wrapped in green, black and gold and tied with a blue ribbon. They’ve both joined the social movement Equal Education, in an attempt to get involved, to do something, to feel part of The Struggle. “Equal Education focuses on quality and inequality. So what I saw the time I joined EE – I saw that a lot of things, black schools struggle to get,” said Mtiya. “If you take a look and compare a school or a learner attending Cape Town High and my school, there’s a lot of difference,” said Mtiya. Through this exposure to activism and to inequality, they have begun to support parts of the student movement and, while neither of them believes that burning classrooms and libraries is advantageous to their future, they’re also not certain of other options. “We believe in umlilo (fire). If you say, fire, fire, then the president or whoever, the minister, is going to pay his attention,” said Makhanda. “Today, young people have nothing to lose and everything to gain,” asserts the leader of the Democratic Alliance, the party that governs their province, Mmusi Maimane. Here, in this dusty yard, with these anxious hands, it’s a ridiculous notion. Photo: Students protest at UCT campus following action taken against key figures in the Rhodes Must Fall movement, by the administration. Andrea Teagle.